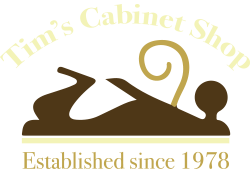 Family owned since our first cut in 1978, Tim’s Cabinet Shop offers the finest hand-crafted cabinetry and wood products for remodeling projects, new home construction, or all of your commercial storage needs. Our passion for woodworking and desire to continually educate ourselves about industry trends and developments has allowed us to continue to craft high quality products that are both functional and stylish in the age of big-box stores, automation, and mass production. The heart of every home is the kitchen. This versatile room is not only the place where we make and share our most fabulous meals; it is a favorite gathering placewhere some of our most wonderful memories are created. You want your kitchen to be not only warm and welcoming, but highly functional as well. 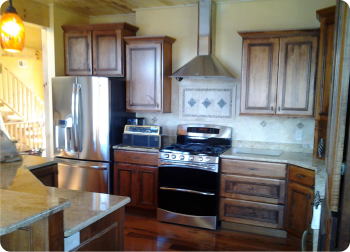 Tim’s Cabinet Shop is here to help make your vision of your ideal custom kitchen become a reality. Whether you need a bathroom designed for a new home or business construction, or if you are remodeling an existing bathroom, the experts at Tim’s Cabinet Shop can design the perfect bath for your space. For our experienced craftsmen, custom bathroom work is just another day at the office. Do you have visions of the perfect custom bathroom that provides a relaxing sanctuary after a long day? Come in and talk to us! Let our nearly four decades of experience speak for itself. Whether you need a bathroom designed for a new home or business construction, or if you are remodeling an existing bathroom, the experts at Tim’s Cabinet Shop can design the perfect bath for your space. For our experienced craftsmen, custom bathroom work is just another day at the office. Do you have visions of the perfect custom bathroom that provides a relaxing sanctuary after a long day? Come in and talk to us! Let our nearly four decades of experience speak for itself. The master cabinet makers at Tim’s Cabinet Shop have nearly four decades of experience designing and crafting custom cabinetry to meet even the most challenging design needs. Whether you need custom cabinetry for an odd-shaped room, or a built-in cabinet for your home theater, or a whole new kitchen or bath outfitted with custom cabinetry, we have the experience, knowledge and expertise to do that.